In the aftermath of a zombie apocalypse, a small group of survivors travel across the country in search of a new home away from the hordes. Rick Grimes, who was a police officer in the old world, leads the group. As their situation grows more and more grim, the group's desperation to survive pushes them to do almost anything to stay alive. Daryl Dixon is a Southern hunter and expert tracker who constantly lives in the shadow of his brother, Merle. Like his brother, he is initially shown as volatile, short-tempered, and of questionable repute, but is tolerated by the group due to his survival skills. Daryl becomes furious when Merle goes missing due to Rick Grimes having handcuffed him to a rooftop in Atlanta, eventually leading Rick Grimes to start a search party for him. However, they are unable to find Merle. Merle and Daryl had initially intended to ransack the Atlanta group for supplies. Daryl becomes more independent and eventually starts to bond with the group. With his skills he quickly becomes a valued member of the group as Shane becomes more and more unhinged. Daryl eventually becomes one of the most relied on of the survivors and has largely shed his aloof personality, with the exception of dealing with strangers. From very early, he is shown to be an extremely proficient zombie killer in both close quarters and ranged weaponry, and later becomes Rick's trusted right-hand man and protector. He also becomes "the go-to guy" of sorts for the group and is now well-liked and respected for his endeavors. This sentiment remains where he is shown to be somewhat of a celebrity by the newer prison community arrivals for his hunting prowess. He also steps in a leader while Rick figures things out but is happy to give the role back when Rick's ready. 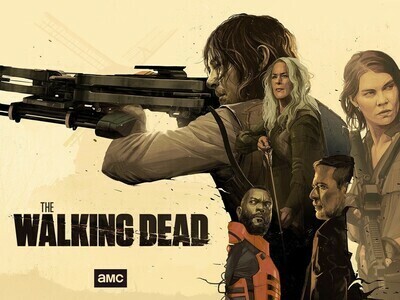 Daryl is now one of only five members of the original Atlanta group who continues to survive, along with Rick, Carl, Glenn, and Carol. In their childhood, Daryl and his older brother, Merle, lived with an abusive, alcoholic father. He was raised by Merle, though Merle was often away (sometimes serving time in juvenile institutions). Daryl spent significant periods of time alone and, throughout these lonely periods, learned to fend for himself and adopted a hard-boiled survivalist mindset. He was lost in the woods for day and no one even realized he was gone. He eventually found his way home after struggling and getting poison oak. Daryl first appears furious when the scavenging survivors, along with Rick, return to the campsite without Merle. Daryl becomes upset with Rick for handcuffing Merle to a roof, and with T-Dog who admits to dropping the key. He, Rick, Glenn, and T-Dog soon head back into the city to rescue Merle, only to find his severed hand in the place where he had been left. Daryl grieves for his brother for a short time before managing to bottle up his emotions and continuing to put on a strong appearance. While he and the others search the streets for any sign of Merle, they run into a band of thugs, one of whom is captured by the group and threatened numerous times by Daryl. After realizing that the "thugs" are merely nursing home employees and intend no harm, they return to the camp. Shortly following their return, zombies invade the campsite and kill many of the survivors. The following morning, Daryl helps impale, carry and burn the dead survivors (one of whom he allows Carol to impale because he was her abusive husband). When the survivors find out that Jim has been bitten, Rick thwarts Daryl's attempts to kill Jim. Instead, Daryl is convinced to let Jim die peacefully in the woods. Daryl and the others briefly find respite at the CDC, enjoying the luxuries the facility has to offer, including hot water and couches to sleep on. He enjoys dinner and wine with everyone and learns about TS-19 and Dr. Jenner's work, as well as the fall of the CDC's infrastructure. He is enraged when Jenner attempts to lock them inside the building that is about to blow up and attempts to kill Jenner. The group is successfully able to escape due to Rick's grenade (which Carol had found in Rick's uniform while doing laundry and saved), which shatters the windows. Daryl drives off as the ruins burn. Daryl is shown to be calmer and more cooperative and has developed fledgling friendships with various group members. He also reveals a more compassionate side, defending fellow group members' lives from zombies on multiple occasions and assisting them in their times of need. It is he who searches the most for Carol's missing daughter, Sophia, and refuses to give up. He slowly begins to form a bond with Carol, who was previously a victim of abuse like he was. She befriends him and encourages him to think better of himself. Following the revelation that Sophia reanimated as a zombie and was in the barn, he becomes emotionally detached from everyone and hesitates to go out looking for people anymore. Carol attempts to bring him back into the fold of the group, much to his frustration, and he attempts to avoid the group as much as possible, especially Carol. 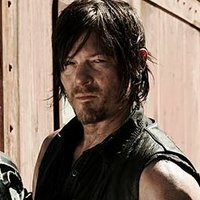 After a time, Daryl starts to warm to the group again; he participates in meetings and helps out Rick and Shane with their prisoner, Randall. 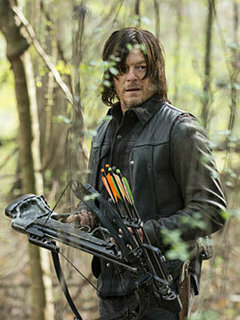 Daryl shoots Dale out of mercy when he is fatally attacked by a walker, as Rick is hesitant to kill him, and rebuffs Carol's attempts to convince him that they should go it alone when Rick's leadership is in doubt. Daryl asks Carol what she really wants, and she declares she wants "a man of honor"; Daryl responds, "Rick's got honor". While it is implied that he may share his brother's racist beliefs, they are not apparent. This suggests that he may have overcome them after being forced to work with the group. However, the motorcycle that Daryl rides throughout much of season 2 bears an insignia used by the Schutzstaffel that is commonly featured in Nazi and white supremacist ideology. Daryl states to Dale that the motorcycle was Merle's. He jokes that he could identify Glenn by his driving, due to Glenn being Asian (a joke which Glenn laughs off). Daryl usually has a serious demeanor, but occasionally makes wry comments and jokes to break the tension. By season 3, he has become a responsible, trusted and loyal member of the group. His priorities are tested when he learns that his brother is still alive and working for an opposing group. After Lori and T-Dog are killed, Rick goes crazy for a while. While he is off coming to terms with his wife's death, Daryl takes charge, and with Maggie's help, saves the newborn Judith. Later , when Rick thanks him, he merely says "It's what we do." When he thinks that Carol is dead, he puts a single Cherokee Rose on her grave. This is the flower that he gave her to give her hope in finding her daughter Sophia. During the group's attack on Woodbury, Daryl shoots(and kills) 2 Woodbury guards. Later Daryl is captured. After accusing Merle of treason, The Governor orders the brothers to fight to the death in the Woodbury arena, with its citizens surrounding them and screaming with blood lust. Daryl and Merle escape after intervention from Rick and Maggie. Eventually, the present group members disagree with letting Merle back in. When Merle antagonizes the group, Rick knocks him out as they further discuss his re-entry. It is decided that they will not welcome Merle back; in response, Daryl leaves with Merle. He saves a Mexican family from walkers with minimal help from Merle. Following the rescue, Merle attempts to loot the family's car but Daryl stops him. Daryl decides to go back to the prison; he and Merle get into an argument as Daryl walks away. Merle accidentally rips his shirt, revealing childhood scars on Daryl's back from their dad. Daryl hurriedly covers his back and walks off. Merle is hesitant to follow, as he knows he will never be accepted into the group, but he follows. They save Rick outside the prison when a herd of walkers are let loose by the Governor and his followers. After Merle is killed by the Governor, Daryl is forced to put down walker-Merle, and takes his death hard, crying.